Brindle beauty with a pedigree to go with it. She is confirmed bred to JRR Bull Durham for a spring 2019 calf. Q is gentle and easy to work with and is a spectacular mother. Consigned to NTLA sale in May. Consigned to NTLA sale in May. 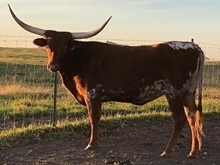 Coral is a pretty little light red heifer out of a 44" cow and and a 48" bull. Beautiful little red heifer out of a 46" cow and a 48" bull with a TTT of 68". She is quite petite for her age. Hard to say for sure, but she may darken as she matures. Flashy little heifer with a super sweet personality. Sale pending! Price reduced!! Willy is a gorgeous dark brindle, proven bull with an impressive amount of horn for his size.